A very famous, albeit sad, anniversary of a great ship. From launch to maiden voyage, 100 years ago today. 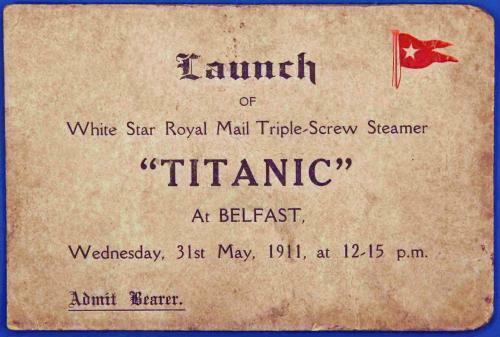 And just four, short days after RMS Titanic left Southampton for her maiden voyage; on April 14th, at 11.40 pm …. Not even a year after the launch. 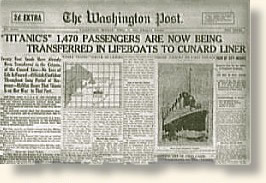 “The Sinking of the Titanic, 1912,” EyeWitness to History www.eyewitnesstohistory.com (2000). 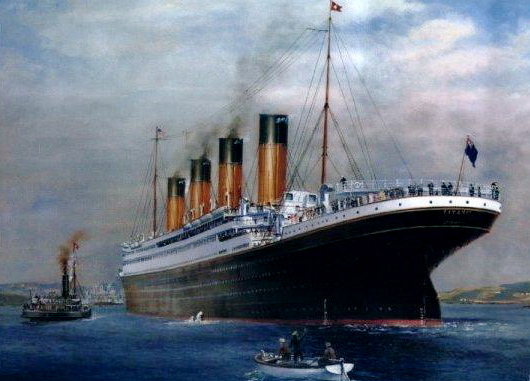 On April 10, 1912, the Titanic, largest ship afloat, left Southampton, England on her maiden voyage to New York City. The White Star Line had spared no expense in assuring her luxury. A legend even before she sailed, her passengers were a mixture of the world’s wealthiest basking in the elegance of first class accommodations and immigrants packed into steerage. She was touted as the safest ship ever built, so safe that she carried only 20 lifeboats – enough to provide accommodation for only half her 2,200 passengers and crew. This discrepancy rested on the belief that since the ship’s construction made her “unsinkable,” her lifeboats were necessary only to rescue survivors of other sinking ships. Additionally, lifeboats took up valuable deck space. Four days into her journey, at 11:40 P.M. on the night of April 14, she struck an iceberg. Her fireman compared the sound of the impact to “the tearing of calico, nothing more.” However, the collision was fatal and the icy water soon poured through the ship. Read more of this fascinating account, especially the story of Elizabeth Shutes who, aged 40, was governess to nineteen-year-old Margaret Graham who was traveling with her parents. As Shutes and her charge sit in their First Class cabin they feel a shudder travel through the ship. At first comforted by her belief in the safety of the ship, Elizabeth’s composure is soon shattered by the realization of the imminent tragedy. Also grateful to my cousin, Rose F., who sent me a link to a story in the British newspaper The Telegraph that came out in September, 2010. I don’t have permission to reproduce that story but hope that it being 18 months since it was published by the Telegraph makes my act forgiveable! It was always thought the Titanic sank because its crew were sailing too fast and failed to see the iceberg before it was too late. But now it has been revealed they spotted it well in advance but still steamed straight into it because of a basic steering blunder. According to a new book, the ship had plenty of time to miss the iceberg but the helmsman panicked and turned the wrong way. By the time the catastrophic error was corrected it was too late and the side of the ship was fatally holed by the iceberg. Since his death – by then a war hero from the Dunkirk evacuation – it has remained hidden for fear it would ruin his reputation. The change meant there were two different steering systems and different commands attached to them. He turned the ship right instead of left and, even though he was almost immediately told to correct it, it was too late and the side of the starboard bow was ripped out by the iceberg. “The steersman panicked and the real reason why Titanic hit the iceberg, which has never come to light before, is because he turned the wheel the wrong way,” said Lady Patten who is the wife of former Tory Education minister, Lord (John) Patten. Whilst her grandfather Lightoller was not on watch at the time of the collision, her book Good as Gold reveals that a dramatic final meeting of the four senior officers took place in the First Officer’s cabin shortly before Titanic went down. There, Lightoller heard not only about the fatal mistake, but also what happened next, up on the bridge. While Hitchins had made a straightforward error, what followed was a deliberate decision. Bruce Ismay, chairman of Titanic’s owner, the White Star Line, persuaded the Captain to continue sailing. 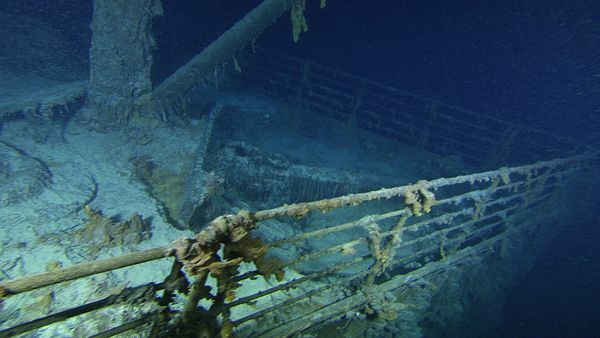 For ten minutes, Titanic went “Slow Ahead” through the sea. This added enormously to the pressure of water flooding through the damaged hull, forcing it up and over the watertight bulkheads, sinking Titanic many hours earlier than she otherwise would have done. The truth of what happened on that historic night was deliberately buried. Lightoller, the only survivor who knew precisely what had happened, and who would later go on to be a twice-decorated war hero, decided to hide what he knew from the world, including two official inquiries into the sinking. By his code of honour, he felt it was his duty to protect his employer – White Star Line – and its employees. 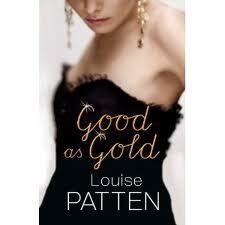 Lady Patten said: “The inquiry had to be a whitewash. The only person he told the full story to was his beloved wife Sylvia, my grandmother. As a teenager, I was enthralled by the Titanic. Granny revealed to me exactly what had happened on that night and we would discuss it endlessly. She died when I was sixteen and, though she never told me to keep the knowledge to myself, I didn’t tell anyone. My mother insisted that everything remained strictly inside the family: a hero’s reputation was at stake. Nearly forty years later, with Granny and my mother long dead, I was plotting my second novel and it struck me that I was the last person alive to know what really happened on the night Titanic sank. My grandfather’s extraordinary experiences felt like perfect material for Good As Gold. Anyone who reads this and is as fascinated as I was should read the comments as there is much discussion about the nature of the steering error. Happiness = Ten minus five or thereabouts! Very interesting. These new revelations, if true, are fascinating. Perhaps even more interesting, there have been many much larger sea disasters since. Whereas it is useful to study one in ever greater detail, the others deserve mention too, because they are wisdom juicy in their own special ways! That’s a sobering reflection and a very quick web search confirmed that, see http://en.wikipedia.org/wiki/List_of_maritime_disasters (assuming this is an accurate list). We seem incapable of learning from the lessons of history. Almost a century later, a probe to Mars was lost for a similar reason. I guarantee that even in a thousand years, you won’t guess what Pedantry wrote about with regard to his own explanation of how the Titanic was lost. Do take a peek! Excellent Post Paul… the BBC here has been paying their own tributes with much information as to those who were upon the Titanic. Much coverage.. But like your commenter’s have said, More huge disasters have taken place since then, with tragic loss of life…. A fitting tribute to all who have lost their lives at Sea.. I share your puzzlement, especially as the story was carried by a newspaper of the calibre of the Daily Telegraph many months ago. P.